Master clothier Hans Grohe (1871-1955) was an innovator. In 1899 he moved from Luckenwalde near Berlin to the small Black Forest town of Schiltach. Two years later he turned his back on weaving and established a metal pressing workshop. Hans Grohe had a passion for the element water, and so from 1901 onwards he bravely hedged his bets on the sanitary sector, still in its early stages of development. Of course bathrooms in private houses were only just becoming fashionable at that time. He specialized in tin showers, thus laying the foundations for untold success. During the course of the 20th century, Hans Grohe’s small three-man operation in the Kinzigtal valley developed into a global company. Today it is one of the international innovation and market leaders for mixers and showers. From the trickle device to the digitally controlled XXL showering pleasure: since 1901, inventions from the Black Forest think tank have been shaping the bathroom landscape all around the globe. 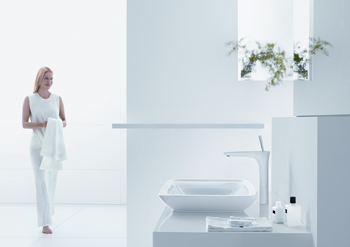 Lots of products, concepts and solutions developed and designed at Hansgrohe have provided incentives for the international sanitation sector. Some made bathroom history, maybe even cultural history. Such a long and successful history obligates and motivates Hansgrohe to stay ahead of its time. 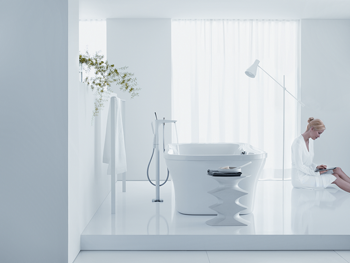 Hansgrohe can look back on a rich culture of innovation. The bathroom professionals achieve around a third of their total turnover with new products. Development times and innovation cycles are becoming ever quicker: these days it only takes 12 to 18 months from the first idea to the finished product. “Made in Germany” has always been a recipe for success for Hansgrohe. Around 80% of Hansgrohe production takes place in Germany: in six plants in the Black Forest. The mixer and shower manufacturer delivers to around 130 countries on all continents and more than 80 percent of its sales are generated abroad. The question is, why does a company with such a broad international base still produce in Germany – when it would seem to be more cost-effective to produce all over the world? The answer from the Black Forest is because they count on German expertise and offer their customers a guarantee of quality.